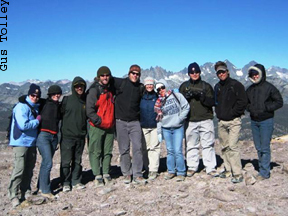 Earth Science 6: Mountains, Boots & Backpacks! 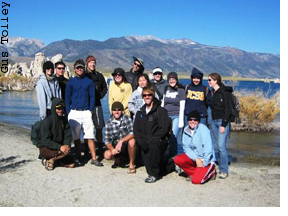 An 8-day, field course (Sep 17-24, 2017) to investigate earthquakes, volcanoes and related geologic, geomorphic, and hydrologic processes in the beautiful and dramatic Owens Valley, Sierra Nevada, Mammoth Mountain, and Mono Lake area. 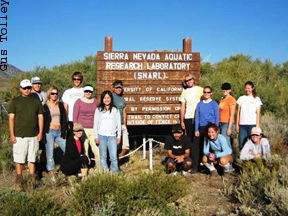 Earth-science problems and processes are approached through hands-on, problem-solving, data-gathering, and field-based studies using the natural landscape as an outdoor classroom. Satisfies both the Area C, Science, Mathematics and Technology and Writing General Education Requirements. 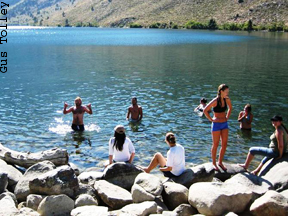 Every day is spent outside and includes 1-2 hours of hiking; lodging is at UC research stations in the shadows of the majestic Sierra Nevada and White Mountains. 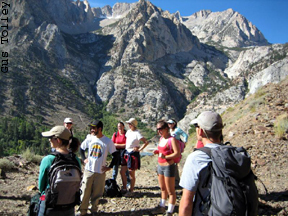 This class focuses on understanding Earth processes in the field. It is a wonderful class and you will learn a lot! Employers tell us that the three most important things they look for in recent graduates are the ability to think, interpret data, and communicate. This class will help you develop those skills. Office hours: anytime. Please come and talk to me when you want help--I do care about your education. Note, however, that I conduct field research during the summer, and so am at UCSB erratically during that time. Course Fees: Approximately $500; includes all room & board, transportation, and class materials. We have to BARC you $300 Jul 1 to reserve your space in the dorm. Are in the field (see below). 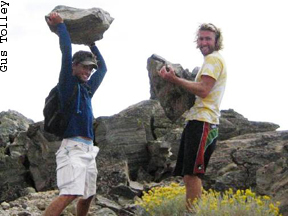 The class is physically rigorous, with 1-4 hr hiking each day, and one all-day hike. 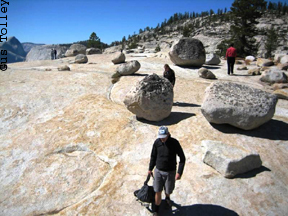 There is no backpacking; we will be back in the dorm/lodge every night and we will carry only daypacks during the day. We will get up every morning at 7 AM, go to the field at 8 AM, and return sometime in the late afternoon to evening to do more work. There are lectures most evenings. 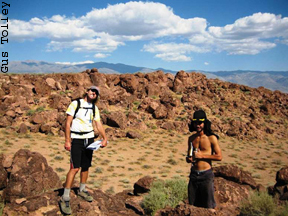 None, but you may enjoy Geology Underfoot in Death Valley and Owens Valley by R.P. Sharp and A.F. Glazner. The course syllabus and reading material will be distributed in the field. All your equipment (see list below) must be packed in a few easily handleable bags and brought to the Webb Hall loading dock (south side, toward the ocean) 30 minutes before departure: 8:30 AM Sunday Sep 17. If you want to bring your stuff a day or two early, you can store it in the "Tectonic Workroom", which is the room immediately to your right when you enter Webb Hall from the loading dock. We will leave for the field from the Department loading dock at 9:00 AM Sunday Sep 17 at the latest. It is about a 7 hour drive to our Bishop with a couple of stops at sites of geologic interest on the drive north. Bring a lunch to eat on this first day. We will return to campus by the evening of Sep 24. Each day we will have breakfast early, make a portable lunch, spend the entire day in the field, and spend most of the evening working, including discussing topics in preparation for the next day. At our field station the temperature averages a high of 71 F and a low of 37 F that time of year. In 2017 the temperature dropped to 18 F at night.